1 Soak the barley overnight in 600 ml (approximately 2 cups) water. The next day, bring the barley and bay leaf to a boil in plenty of salted water. Simmer for about 40 minutes over medium heat and then drain. 2 Meanwhile, peel the shallot and garlic and chop finely. Rinse the mushrooms and chop. Rinse the herbs, shake dry and pluck of the leaves. 3 In a saucepan, heat 2 tablespoons of oil and sweat the shallots and garlic until glassy. Add the tomato and broth and simmer for about 15 minutes over medium heat. Crush the tomatoes slightly with a whisk. 4 Sauté the mushrooms in a hot pan with oil and until the juices have evaporated. Stir in the herbs, season salt and pepper to taste and remove from heat. 5 Season the soup with salt and pepper. 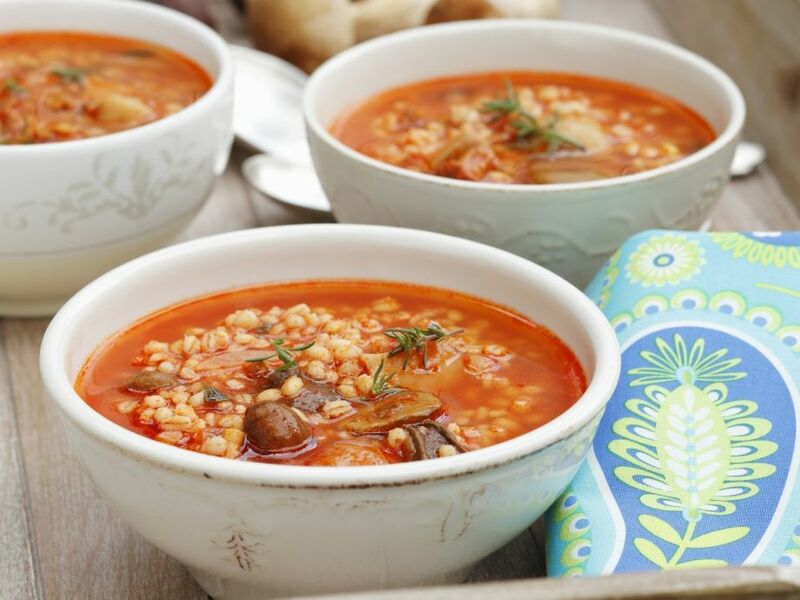 Stir in the barley and mushrooms, boil briefly, season again and serve in bowls.